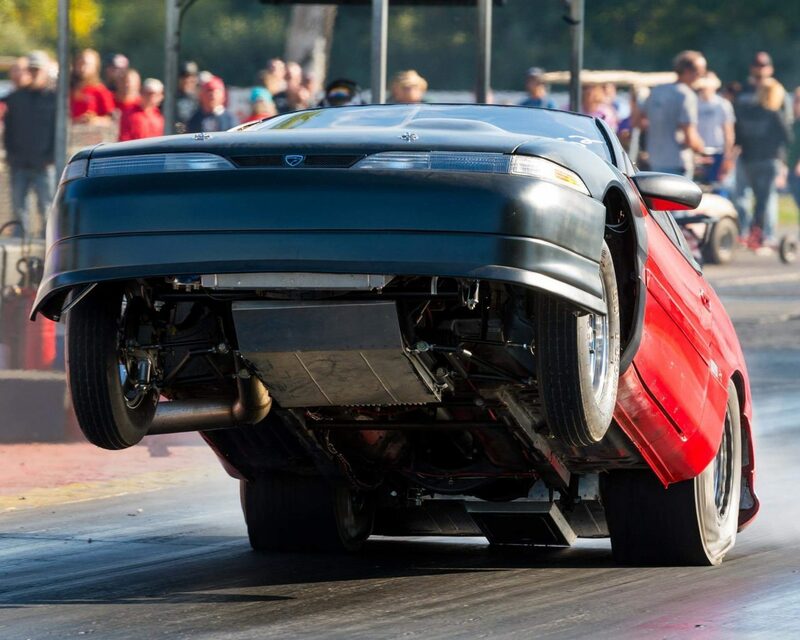 FTY Racing’s 4-linked RWD Eagle Talon is our own project car. Many of the parts we create and sell are developed and tested on this drag car. After racing for many years, we decided to turn this from a street car to a dedicated race car in 2004. In it’s current form, our RWD Talon was completed in 2008 and we have been racing it since that time. 2.3L Mitsubishi 4G63, partially filled block. Wiseco HD2 pistons, 10.5:1 compression ratio. Manley turbo tuff connecting rods. Kiggly Racing Street series valve springs. Kiggly Racing HLA pressure regulator. Garrett GT4202 journal bearing turbo, 1.15 T6 exhaust housing. FTY Racing custom Air:Water intercooler. FTY Racing custom intercooler piping and boost bracing. FTY Racing custom sheetmetal intake. FTY Racing custom stainless exhaust manifold. FTY Racing custom 4″ stainless exhaust, hood exit. FTY Racing custom blend GEM45 fuel. FTY Racing custom electromechanical 12/24V fuel pump, 1300+LPH. FTY Racing custom fuel cell. FTY Racing custom 12AN fuel rail. Eight lucas-style 160lb/min fuel injectors. Powerglide transmission with vasco planetary gearset, trans brake manual valve body and 1.89 low gear. Chevy 8.5″ 10-bolt rear axle with 4.56 gears and Moser Engineering internals. 29.5″x10.5×15″ Mickey Thompson ET Drag slicks. Billet Specialties Street-lite front wheels, double beadlock rear wheels. As of the end of the 2017 race season, our RWD Talon has posted a best ET of 8.244@163.41MPH. Back halved the car, using a Competition Engineering 4-link kit. Created a full custom NHRA 8.50 certified 4130 chromoly roll cage. Heavily modified the factory subframe, created other miscellaneous chromoly bars to mount components. Relocated engine, created front, mid and rear engine and transmission mounts. Fabricated custom air:water intercooler to hold 15 pounds of ice. Modified sirocco-based radiator and created cooling system. Fabricated aluminum fuel cell and fuel lines. Designed and fabricated sheet metal aluminum intake manifold. Freshened 2.3L 4g63 stroker with new rings and bearings. Fabricated all 3003 H14 aluminum tin work in the car. Fabricated full tubular front subframe and control arms. Created full custom aluminum front hubs with Wilwood brakes utilizing the factory struts. Fabricated 1-5/8″ 304L stainless steel exhaust header. Fabricated 304L stainless steel intercooler piping. Fabricated 4″ 304L stainless steel exhaust. Fabricated custom steel oil pan and oil pick-up tube. Installed Racecraft fire suppression system. Created custom harness and wiring for entire car. Created custom Coil-on-plug based on Montero coils. Created a digital, microcontrolled MAP sensor scaler for improved resolution on a MAP sensor that was larger than could be used with the Haltech E6S-8. Fabricated 4-link reinforcements to live axle. Fabricated custom anti-roll bar for rear suspension. Designed and created 5.8+ GPM electromechanical fuel pump based on Enderle DSR mechanical pump. Freshened head with polish, guide replacement and valve job. Designed and CNC machined twin fuel injector bungs. modified sheet metal intake for dual fuel injector bungs. Designed and CNC machined fuel rail standoffs. Created custom 24 volt fuel pump system. Rewired the car with mil-spec components. Created custom fuel blend, GEM45, unheard of here in the US. Ran entire season on this fuel. Tagged wall at Milan Dragway at the end of the 2015 season. Worked to remove and plan replacement of frame, body panels and parts from Milan Dragway accident. Created custom frame jig to ensure car was square for repair. 3D scanned, modeled, designed and started fabrication on tubular front frame forward of the shock towers, commonly called the radiator support. Completed tubular chromoly radiator support replacement. Created custom body mounts for new fiberglass components. Fabricated Lexan rear and quarter windows. Designed and fabricated aluminum rear wing, including custom CNC wing support brackets. Completed head work on new head. Re-created original air:water intercooler after finding out the original one was damaged in the Accident at Milan Dragway. This required recreating *all* components for the intercooler. Created and added custom boost bracing to intercooler pipes to keep all the boost in. Completed completely custom data acquisition system, high speed with integration with the Haltech’s CAN data. Replaced 4″ exhaust with through-the-hood 4″ exhaust.